Apache Equipment Corporation dba Apache Equipment Rentals opened in April 2004 after acquiring 10 acres located in Phoenix, Arizona at 59th Avenue & Jefferson. In 2017, we relocated to a brand new building on Jefferson. Apache Equipment supplies equipment for a variety of industries, including construction and industrial. We rent equipment and tools including air compressors, aerial scissor lifts & booms, industrial forklifts, extendable reach forklifts, water trucks, backhoes, skip loaders, water pumps, plus much more. We offer reliable and on-time transportation of equipment to the jobsite. We have parts-stocked service trucks with qualified service technicians to keep our customers productive and limit down time. We have available items for sale from numerous vendors like Skyjack, John Deere, Genie, Multiquip and Wacker brands. 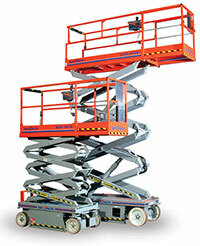 At Apache Equipment Rentals, we strive to make business simple and flexible. We offer our customers the benefits of a large equipment rental store with family store ethics and honest values. We serve the entire state of Arizona.